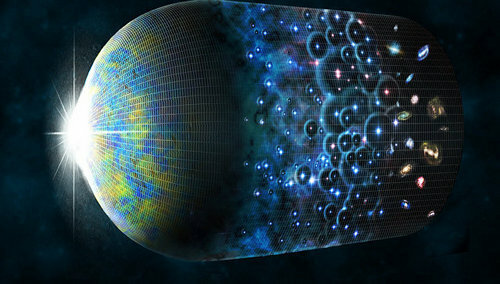 “The background microwave radiation of the Universe should contain traces of black holes that lived in the Universe before the Big Bang.We are not talking about the very singularity or any real objects, but about Hawking’s radiation that has produced these holes during their lifetime, said Roger Penrose (Roger Penrose), a famous British mathematician and cosmologist, whose words broadcast Live Science. Penrose and his colleagues tried to find a way to answer the age-old cosmological question – what the universe represented in the first instants after the Big Bang and how it looked before this cataclysm that gave birth to our universe. Today, as cosmologists explain, there are two approaches to this problem. Most believe that the universe was born from a singularity, a dimensionless point, which began to expand rapidly in the first few moments after the Big Bang. Another group of astrophysicists, including Penrose and his like-minded people, believes that the birth of our universe was preceded by the death of her “ancestress.” It probably happened in the course of the so-called Great Divide, generated by dark energy, or after the onset of complete stasis, the “thermal death” of the universe. Scientists, as the British mathematician points out, have long wondered why matter was distributed unusually evenly throughout the universe in the first moments of her life, despite the fact that her original temperature was very high. Ten years ago, Penrose advanced the idea that this unusual “orderliness” of the universe can be explained by the fact that it was born not from scratch, but within the singularity that emerged from the previous version of the universe after there was nothing left in it except for black holes, photons and other massless particles. Black holes, according to the theory of Stephen Hawking, will gradually “evaporate”, producing the so-called Hawking radiation. As cosmologists emphasize, this is a very slow process – it will continue virtually the entire life of the past universe. Nevertheless, he will leave a special imprint on her appearance and will, as the calculations of Penrose and his colleagues show, affect the structure of the “echo” of the Big Bang. In particular, the so-called Hawking points-heterogeneities in polarization, similar in shape to loops and circles-must appear inside it. A few years ago, Penrose’s supporters found them in the data collected by the space telescope WMAP. Most scientists disagreed with their conclusions, considering such a coincidence an accident. In a new article, Penrose and his colleagues analyzed data from two other observatories, Planck and BICEP2, observing the microwave “echo” of the Big Bang in a different way. As it turned out, both telescopes also see Hawking points. They, as comparison of real “photos” of the background radiation of the Universe with arbitrary data sets show, could not arise by themselves, as a result of coincidence of random factors. All this suggests that the “Hawking points” really spawned the black holes that existed in the “other” Universes. Even if it is not so, the existence of “Hawking points”, according to Penrose, points to the existence of some unknown phenomena and processes in the first moments of the life of the universe, which is almost impossible to explain with the help of modern cosmology.